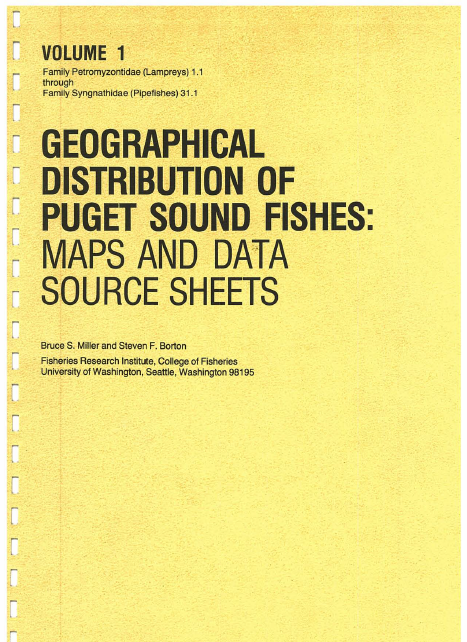 The accompanying maps and data source sheets constitute a comprehensive compilation of records of Puget Sound fish species through 1973. Most records were originally compiled for the Checklist for Puget Sound Fishes (DeLacy, Miller, and Borton 1972). All records were from five main sources: The literature; catalogued entries in the University of Washington collection of fishes; log records from the University of Washington Friday Harbor Laboratories; boat log records from the University of Washington College of Fisheries; and miscellaneous records, the bulk of which were from logs of state, federal, and University of Washington research projects. Records are arranged on the data source sheets in columns under the aforementioned headings. This method facilitated compilation of the records and provides the best way to add records in the future. A data source sheet key is provided to interpret individual entries. We have tried to avoid any duplication of records and have attempted to avoid records of questionable validity. The Puget Sound region (Figure 1), for faunistic purposes, is defined as an area south and east of the United States—Canada international boundary line and east of longitude 123°28’ in the Strait of Juan de Fuca. The further division of the Puget Sound region into 12 areas is based in part on oceanographic conditions but also reflects an arbitrary and expedient definition of areas with some attention to the intensity of the collecting efforts. A dot on the map of a particular species represents one record of that species having been caught or observed at that location. For example, a dot may represent a single fish caught by hook and line or 500 fish caught in one haul of an otter trawl. There is a corresponding data source sheet entry for every dot, but there may not be a dot for every data source sheet entry since once an area was filled with dots no more were added. A wide assortment of gear has been employed in the collection of fish represented here (beach seines, bottom trawls, gillnets, purse seines, traps, spearfishing, hook and line, poisoning, etc.). There is also a great variation in the number of fish caught per record. It would not be appropriate to include such information as number of fish caught without also including other important information such as gear type, net mesh size, depth, bottom type, date, and time of day. Information such as numbers of fish caught can easily be misinterpreted without considering all other information about the collection. Including all pertinent information would not be appropriate considering the time and size limitations and goals of this project. The information is designed to provide an extensive source listing for all collections of fish in Puget Sound. People having a need for collection information or biological data such as length and weight should obtain the original source. The relative sampling effort has varied greatly in the various areas. In general, lower Georgia Strait, the inner Strait of Juan de Fuca, Admiralty Inlet, and Colvos Passage have been sampled less intensively than other areas. The map of an abundant species, such as the English sole (Parophrys vetulus) which is caught by most types of gear and found in a wide depth range, indicates areas most intensively fished. Large blank areas on a map cannot be interpreted to mean that a particular species is not found in those areas. It only means that we have, as yet, no records for that species in those areas. This is often the result of lack of sampling effort for those areas or for that particular species. It is evident, however, for some species that they are more abundant in certain areas of Puget Sound; for example, the blackfin sculpin (Malacocottus kincaidi) is most abundant in Hood Canal. Further study of original catch data reveals that the blackfin sculpin is most often caught in deep trawls in areas of dense shrimp populations, such as are known to occur in Hood Canal. A phylogenetic order of families and species is used in the maps and source sheets (see the List of Families and Species). This order follows the standard set by the American Fisheries Society (1970). We have used Hart (1973) as our reference in those cases where the American Fisheries Society does not list a name. A decimal paging system is used to facilitate the addition of new records and species during future updating. Each family is indicated by the number preceding the decimal point. Species are listed in alphabetical order within a given family and paged consecutively by numbers following the decimal points. Source sheets follow each map and are paged separately by species. The bibliography is of published records only. A “bibliography” or explanation of source sheet categories (p. xvi) is provided for locating or citing sources. The authors would like to emphasize that they welcome any additional information that readers may be prepared to provide. Data are stored on magnetic cards so that records may be added easily. Periodic updating of this information is contemplated. It is our hope that work may soon begin on a similar project to gather information of fish records from the outer Strait of Juan de Fuca and the Washington Coast.